Firebird Raceway is now recognized and listed on the National Register of Historic Places, officially confirmed December 24, 2018. The Idaho State Historical Society validated the announcement on Febr. 1, 2019. Firebird earns the distinction of becoming the first sanctioned NHRA Drag Racing facility in the nation to be nominated, ratified and finalized by the National Park Service in Washington, D.C.
“The New family is so proud and we know this acknowledgement serves to underscore all the hard work our founder, the late Bill New and his wife Ellanor, accomplished when they first built and cultivated Firebird literally from the ground up in 1968. At the same time, this fortifies, bolsters and strengthens Firebird’s footprint in western Idaho for many generations.” added track manager Scott New. The lengthy process first started following a meet `n greet at the Buy Idaho Capitol Show located within the rotunda of the Idaho State Capitol building. This is where John and Brad New first met a group of people with the Idaho Historical Society on January 20, 2016. One of our first contacts was with Annette Shumway, a long-time supporter of Firebird. Annette also competes in Firebird’s Club Series and other races, and she works for the ISHS. She helped to steer us in the right direction and start the preliminary wheels in motion. Through the course of nearly three years of effort from many different people, we were able to accomplish the cumbersome undertaking. Special thanks to Jamee Fiore (National Register Preservation Office), Tricia Canaday (SHPO Oureach Historian), Cassie Dishman and Matt Halitsky (SHPO Office). We are also very grateful to assistance from Tessa O’Donnell who helped with many facets of the script. We also want to convey our appreciation to many others who contributed in a variety of ways to project. Additional we would like to recognize the HIS review board comprised of Shauna Corry (Chair), Nancy Renk (Vice-Chair), Amy Canfield, Kerry Davis and Christina Olson who conducted one of the final reviews of the approval process in Sandpoint this past Fall. Together they approved the final application by a vote of 5-0. Looking back in time, Firebird started in July of 1968. The photo at the top of the masthead is from the track’s inaugural event featuring the “Hemi Under Glass” wheelstander in front of a standing room only crowd. But it was a young high schooler by the name of Dale Pulde who helped to first put Firebird on the proverbial map. In August of ’68, this photo shows the first Funny Car to race at Firebird called “Vicious too”. The Camaro was owned by Californian Charlie Wilson. Together Wilson and Pulde spent the better part of a week promoting Firebird at various businesses in town. 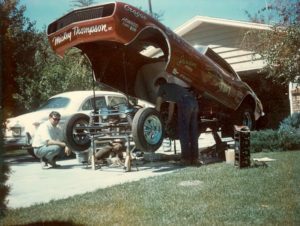 At the same time they serviced their nitro car right in the front driveway of Bill and Ellanor’s first home on the Boise bench. Yes, that white one-owner `50 Ford was Bill and Ellanor’s daily commuter at the time. Their three sons were just 7, 4 and 1 years of age. When Charlie asked Bill if he could fire the car up in front of the garage to make sure it was race ready, Bill said, “You bet”. As the tale goes, every neighbor within a city block stopped by after the fire up to make sure everything was ok at the New family household. To put it mildly, this is how it all began for Firebird. A story that has many chapters over better than 50 years of operation in the foothills above Idaho’s capitol city.